The National Eisteddfod will be given more money by the Welsh Assembly Government for this year's festival. 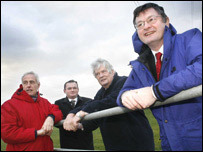 Culture Minister Alun Pugh described the extra £62,000 as "substantial", taking assembly government support for the 2007 Mold event to £470,000. The extra funding is conditional on what the assembly government called "the continuing modernisation agenda". Director Elfed Roberts said he was very pleased Mr Pugh recognised progress "in widening the appeal of the festival". The eisteddfod has had long-running financial problems, which even led to it considering bankruptcy at one stage. 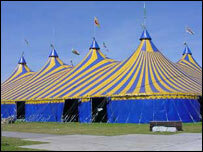 The eisteddfod also received a payment of £50,000 for the 2006 event in Swansea from the assembly government. Mr Pugh confirmed the new money as he visited the site of next summer's festival in Mold. The minister said the Swansea eisteddfod had been "extremely successful and I want to see the festival continue to work on widening its appeal to new audiences". Mr Pugh said Swansea showed "it was possible to widen the appeal of the eisteddfod without diluting the central focus of the Welsh language," and the money allowed it to "travel to parts of Wales where the Welsh language is not widely spoken as a community language". Mr Roberts promised that the eisteddfod would carry on with its work to attract more people "and at the same time raise the profile of the Welsh language and culture of Wales". The conditions will be "closely monitored" by the Welsh Language Board and the assembly government. The eisteddfod will receive the extra money through the Welsh Language Board.